This article is about the Space location in Super Paper Mario. For other uses, see Space. 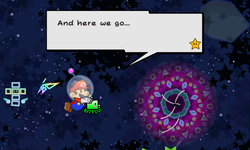 Outer Space is the setting of Chapter 4 in Super Paper Mario. Chapter 4 may not take place in the outer space above the Mushroom Kingdom, but rather that of another dimension. It was once the location of the Squirpia kingdom. In Chapter 4-1, the heroes meet Squirps, a mysterious alien creature who functions as a ray gun for stages 4-1 and 4-3, as well as in the battle against Brobot. A large portion of this chapter involves a Squarp Hole maze, which requires the player to remember which Holes are linked to which in order to progress. (Chapter 4-1: Into Outer Space) A gravity-less level with many warps and enemies. The heroes meet Squirps the alien here. (Chapter 4-2: A Paper Emergency) An apparently small planet with low gravity. This level mainly consists of searching for toilet paper to relieve Fleep, who is needed to complete the level. (Chapter 4-3: The Gates of Space) Similar to 4-1, but with many more blocks and similar objects. Much of the level involves searching for chocolate to give to Squirps, in order to open a Space Gate. (Chapter 4-4: The Mysterious Mr. L) A strange place also known as the "space graveyard". This level's main gimmick is gravitational anomalies that allow the player to walk on the walls and ceiling. Mr. L and Brobot are battled here. Through the fierce battle against Francis, Tippi and the Mario gang grew closer. Behind a fourth door lay a whole new world that beckoned to them both. Upon entering the green door at the top of Flipside Tower, Mario and co. find themselves in space and realize that they cannot breathe. Tippi warps them all back to Flipside, where they tell Merlon about their problem. He explains that a helmet would allow them to breathe, but he gave away the only one he had to a little boy, who the heroes discover to be Pook. Pook is using the helmet as a fishbowl for his pet, Captain Gills, who is growing too large for it. Pook gives the heroes the fishbowl and asks them to release Captain Gills. After placing the fish in a canal in Flipside's basement, the heroes return to space and put on the helmet, allowing them to explore the new world. The heroes follow an SOS to a space capsule, containing a small alien named Squirps, who knows of the heroes and their mission to gather the Pure Hearts. While Tippi is suspicious of Squirps, Mario accepts the alien's help. Squirp opens a warp called a Squarp Hole, which he says will take the group directly the Pure Heart. However, the warp is far off target and the heroes are forced to navigate a maze of Squarp Holes. The level's lack of gravity allows the player to move anywhere they want using the D-Pad. As they cannot stomp enemies in this state, they may instead use Squirps' Squirt Beam to attack enemies. The level is mostly empty, aside from enemies and stationary asteroids. There are many Squarp Holes in the level, with the correct warp usually being the one farthest away from where the heroes started from. "Outer space... A vast and unknowable nothingness. You met Squirps here in a strange space capsule..."
If on the second visit to the level the player consistently answers "no" to the prompt to use the space helmet, Tippi will personally attempt to convince them otherwise. After that, if the player says "no" thrice, she will abandon the player in frustration, resulting in a Game Over. Upon further visits, the helmet is equipped automatically once they pass through the door. This page was last edited on March 4, 2019, at 13:18.